After a seven year drought of Action Packs, it seems that the series is definitely picking up the pace, averaging one new Action Pack a year for the past four years. 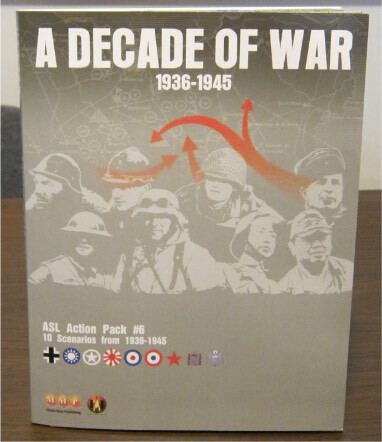 Action Pack #6: A Decade of War (AP6) is not merely the latest in the Action Pack series, however. Rather, it represents that rare ASL phenomenon known as an innovation. Granted, the innovation in AP6 is a somewhat mild innovation, but baby steps, folks, baby steps. It’s nice to see anyone break new ground in ASL. And new ground is precisely what is broken in AP6. Of course, the hook to any Action Pack is that it is not only a scenario pack but also delivers new official geomorphic mapboards to the eager clutches of ASLers. AP6, however, does not merely deliver new geomorphic mapboards, but actually introduces a different kind of geomorphic mapboard. It only took the ASL system a quarter century to realize that there could be more than one style of geomorphic mapboard. Actually, the main wunderkind behind AP6, Gary Fortenberry, has said that he proposed the idea to Avalon Hill years ago, but the notion was shot down. Luckily, MMP proved more receptive. So what are these new geomorphic maps like? Well, they are not radically different from the older ones; in fact, they are designed to mate with them. However, they mate with them in a different way. The long side of each of the new geomorphic maps (at 16″) is designed to mate with the short side of two old-style geomorphic maps side by side (8″ each). Alternatively, the short side of the new geomorphic maps (at 11″) can mate with half of a long side of one of the old geomorphic maps (at 22″). Confused? We’ll explain. Well, we don’t have time to explain, so we’ll sum up: these maps link up long side (of whichever type of map) to two short sides (of the other type of map). Look at the darn pictures. The map artwork, by the way, is crisp, clean, and attractive. Note that all of these boards come in an “a” version and a “b” version. The “b” version is on the reverse side of each “a” version. 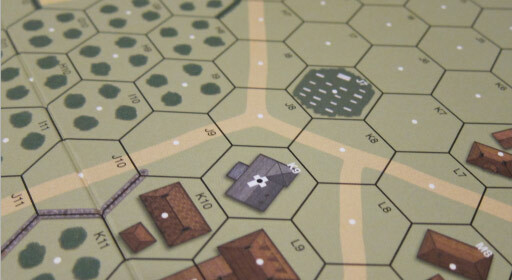 The only difference between an “a” and a “b” version is that the short board-edge woods hexes on version “a” are slid over a bit on version “b” so that there are never any of those odd little half-woods hexes that crop up in the single-sided old style geomorphic mapboards (which, originating as a series of mounted mapboards, never had a second side, though they could have benefited from the same treatment). The decision to create these second, offset sides is an interesting one. Clearly, ASL players have been living with half-woods hexes for a quarter century (with apparently little complaint), and printing double-sided maps would obviously add to the cost of printing. This seems to have bumped up the price of AP6 a tad. Its list price as $36, which can be compared to the AP5 list price of $30. AP5 also contains an additional scenario card, but that would not be much of an additional expense. It seems then that, unless MMP ate some additional cost, the backprinting may have added about $5 to the sticker price of AP6. Whether or not removing woods half-hexes is worth an additional cost is probably an issue on which people might legitimately disagree. However, even at $36, AP6 still seems reasonably priced, so there is probably not too much to complain about. If anybody complains, it is probably more likely that subset of the ASL audience that likes to make copies of ASL maps (either to laminate and/or to magnify). Such people will now have to copy both versions of the map! Such is life. Since being revived by AP 3: Few Returned, the Action Pack series has been themed (as opposed to Action Packs 1 & 2, which had essentially random scenarios). AP6 does technically have a theme, though a pretty weak one. 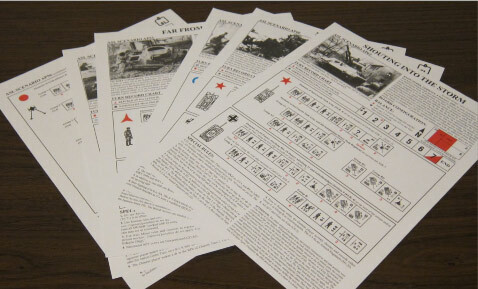 The original concept behind AP6 was that it would have 10 scenarios, each set during a different year (with conflicts like the Spanish Civil War and the Sino-Japanese War holding the fort until World War II proper begins). In the end, it did not quite work out that way, as one of the scenarios for some reason proved to be unsuitable and was replaced with a substitute scenario that duplicated another year. As a result, there is no 1941 scenario but rather two 1942 scenarios. Aside from this, however, the pattern runs true, with the result that there is an interesting variety of scenarios that runs from the beginning of the Spanish Civil War all the way to the last weeks of World War II inside Germany’s own borders. Thematically, then, the 10 AP6 scenarios feature actions set in Spain 1936, China (1937, 1938, 1939), France 1940, Malaya 1942, the Philippines 1942, the Soviet Union 1943, Belgium 1944, and Germany 1945. This means the combatants are varied, too, including Spanish loyalists (actually mostly ex-German communists! ), Spanish nationalists (ironically mostly Moroccans! ), Chinese, Japanese, German, French, British, American, Filipino, and Soviet troops. What is especially nice is that five of the scenarios feature the Japanese, who have been quite neglected in official ASL products recently, and three of those also feature the Chinese, who are the most neglected major nationality of all. It is also nice to see the Filipino and early war Americans make an appearance, as well as to see an addition to the extremely small number of official Spanish Civil War scenarios. All 10 of the scenarios in AP6 are designed by one person: Gary Fortenberry (the only other previous time this happened in an Action Pack was with AP3). Gary Fortenberry was the publisher in the early 1990s of one of the early ASL newsletters, ASLUG, which published two dozen well-received scenarios, most designed by Fortenberry, before abruptly folding. Fortenberry was then subsequently briefly employed by Avalon Hill to manage its ASL line of products. After this stint, Fortenberry dropped off the ASL map (so to speak), preferring, it was said, the collectible card game Magic: the Gathering. However, in the late 2000s, Fortenberry began to re-emerge on the ASL scene, both as a player and designer. 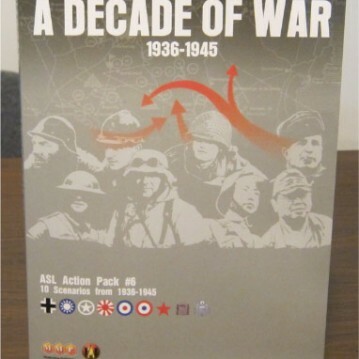 With AP6, Fortenberry joined forces with two other veterans of Avalon Hill: former Avalon Hill luminary Bob McNamara is credited with historical research and map design, while ASL icon Charlie Kibler was involved both with the map design and the (attractive) map art. Interestingly, many of the credited playtesters for AP6 are well-known as skilled ASL players with many tournament wins, including Bob Bendis, Guy Chaney, Gary Mei, Mike McGrath, and J.R. Tracy among them. Great ASL players are not necessarily great playtesters (or vice versa), but let’s just say it don’t hurt much. Though the AP6 packaging describes the scenarios as having been developed “with tournament players in mind,” most of the scenarios are too large for convenient tournament play. Three of the scenarios are medium-sized and would probably be fine in a tournament, but the remaining seven are large in size (and many in length as well) and could not easily be used in a tournament (though, of course, they would be fine for casual play). The scenarios are fairly SSR heavy and some of the Victory Conditions are also complicated. Two scenarios use OBA, two scenarios have Air Support, and one scenario has rice paddies (in-season). Many of the scenarios depict interesting situations. AP53 (Far from Home), the Spanish Civil War scenario, is a nice meaty scenario that starts small and grows larger, with plenty of thin-skinned tanks just waiting to be killed. AP54 (800 Heroes) depicts the battle for the Sihang Warehouse in Shanghai, a situation that has been scenario-ized several times already, but because of its size, the scenario could end up being a popular tournament scenario, if it proves to be balanced. AP56 (Quagmire), another Sino-Japanese scenario, is a very meaty scenario with a lot of twists to it. Played on a large map area, it features 5 groups of Chinese defenders, four of which set up in separate areas, along with some rare Chinese artillery pieces. There are 32 Chinese squads in all, most of them 1st line squads. The Japanese attackers are divided into 5 main groups (and a “support group” with various guns and mortars), which also must set up or enter in separate areas. The combination of all of this will result in a battlefield that really consists of a number of separate battles all being fought simultaneously, which doesn’t happen as much in ASL as perhaps it should. This is an all infantry scenario (even the artillery gets pulled by horses), which means that it should play quickly for its size. However, non-veteran players might be put off somewhat by the presence of rice paddies and three fighter-bombers. Armor aficionados do get their own day in the sun, though. 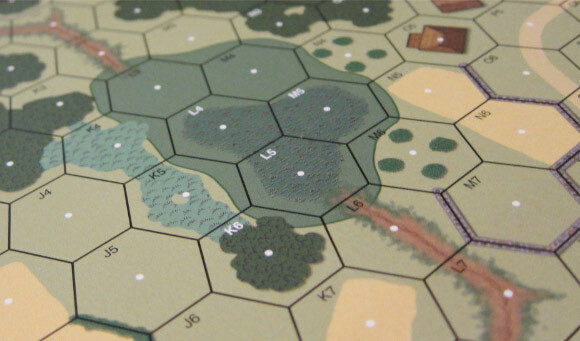 AP57 (Kleckerweise) depicts a French attack in 1940 down a long stretch of mapboard, hoping to capture a hill at the far end of the map. They have 18 squads, 8 tanks, and assorted toys to help them do it. The Germans start with a scratch force but after a few turns begin to get substantial reinforcements flowing into the battlefield, including 10 AFVs. AP60 (Nishne, Nyet!) takes players to a more late war, heavy metal realm. The Germans are on the attack in this scenario, with 22 squads, a variety of toys, good leadership, and 15 AFVs (including 6 Tigers), one of which will sport a fancy 9-2 armor leader. The defending Soviets have 15 squads, 6 (mostly crappy) tanks, and three artillery pieces. The victory conditions are more complicated than a polygamist family reunion. 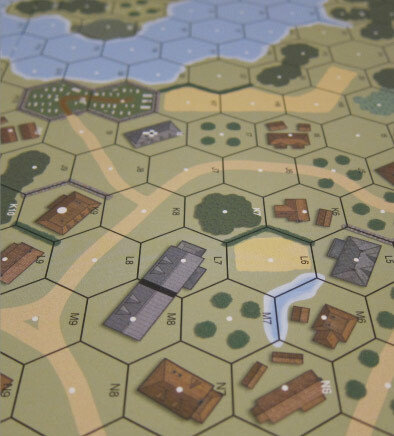 The third big AFV-centric scenario is AP61 (Desobry Defiant), which depicts a classic Battle of the Bulge holding action: a scratch force of American engineers and AFVs must delay an attacking German Panzer formation as long as it can. Here the stalwart red white and blue boys have 11 squad equivalents (of different types), a .50 caliber MG, 80mm OBA, DCs, AT mines, an AT gun, and odds and ends. Oh, and AFVs, including some Shermans, a Priest, an armored car, and two tank destroyers (three of which have Gyrostabilizers). They come with a 9-2 armor leader and an 8-1 armor leader (they still have that new tank smell on them). Trying to get around, past or through these folks are 18 German squads (from 2nd line to elite), with light toys of their own, as well as 100mm OBA, plus an armored force led by its own 8-1 armor leader consisting of Mk IVs, Panthers, StuGs, and a bevy of halftracks (including one sporting a 75mm gun). One of the quickest playing scenarios, though, is AP59 (Taking Heads), a delaying action set in the Philippines in early 1942. A dozen 4-4-7 Filipino squads, bolstered by a .50 cal, 2 MMGs, 2 halftracks sporting 75mm guns, and a light AT gun, must hold off a force of 16 Japanese squads (mostly elite), who have a few LMG, a 20L ATR, a DC, and 3 knee mortars. With an ELR of 2 and only three (not so great) leaders, the Americans are brittle, but the Japanese have to cross open ground (and even then will tend to be at a TEM disadvantage) and can be vulnerable to the firepower of the American/Filipino toys. Essentially the Japanese have whittle down the Americans and maintain their advance while not getting too far behind in CVP. If they can do so, the end game will feature a very fragile US/Filipino force trying to defend a bevy of VP buildings from the last Japanese push. However, the edge probably goes to the US/Filipino side on this one. In 2014, several years after AP6’s publication, ROAR results suggest that most of the scenarios in AP6 are quite balanced–much better than average. AP62 (Shouting Into the Storm) has been the most popular scenario, with a knife-edge balance. However, as of this writing, only AP58 (Sat Sri Akal!) seems to possibly have balance problems. Few packs can say this. The one other thing that AP6 features is a page providing “Australian Balancing System” information for each of the 10 scenarios in the pack. The ABS system (guess where it came from) is a bidding system that rewards good analysis of scenario balance. Essentially, each scenario has a set of 3 successively greater balance provisions for each side, and players secretly bid for a side and handicap level (either none, or one of the three provisions for that side). If players each bid on a different side, they get their side of choice, plus the handicap provision (which will reward the other side). If they pick the same side, the higher bidding player gets that side (but must play with the provision), while the other player gets the other side and no provision. If they bid identically, essentially a DR determines who plays what side. Many ASLers like the ABS, but it is also somewhat controversial, in that it tends to reward experienced players at the expense of inferior players. As a result, if a strong player and a weaker player are matched up, use of the ABS can easily give the stronger player an additional edge. As a result, it should only be used with caution between players of potentially different skill levels (especially if the more experienced player has previously played the scenario in question). However, since in AP6 use of the ABS is totally optional, its inclusion can only be considered a plus. Could AP6 have been better? In a couple of ways, perhaps. Some of the map designs could have been a bit bolder, to better take advantage of the new board type, while the scenario mix could have been somewhat better suited for the tournament field that the designer allegedly initially had in mind. Some of the victory conditions are also rather involved. However, the product as is seems very strong. It adds mapboards to the system that are not only new maps but open up new terrain configurations and possibilities as well. It features a variety of actions from the mid 1930s to the end of World War II, featuring a host of nationalities. A number of the SSRs are fairly innovative and help to create good scenario situations. Early reports suggest that most of the scenarios seem relatively well balanced. All in all, it is really quite a solid product and should be on most ASLers’ purchase lists.